Newly-waxed floors gleam, classrooms sport fresh paint, supplies have been ordered and stocked. All sure signs of back-to-school readiness. On Wednesday, September 2nd over 800 Paul Cuffee students poured through the doors of the three Cuffee campuses, eager to begin a new school year. Greeted by our Head of School, Christopher Haskins, and principals, Celeste Terry-Lo (Upper School), Eric Charlesworth (Middle School) and Carrie McWilliams (Lower School), the students were warmly welcomed and began settling in to their new environments and class schedules. “Students and their families across the three school campuses were very excited to return to school, an amazing amount of positive energy matched by the enthusiasm shown by their teachers. Many students commented that, while they’re sorry to see summer go, they’re really happy to return to school to see their friends, classmates and teachers,” Mr. Haskins noted. 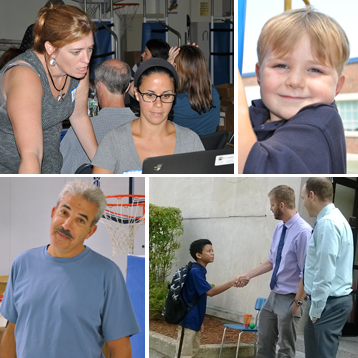 The faculty and staff returned in August to ready their classrooms, meet with their grade level colleagues on curriculum, conduct home visits, and for some, blog about the Common Core. Kelsey Lucas, Paul Cuffee School seventh grade math teacher, shared her perspective on Solving the Problem with Common Core on Educationpost.org on August 26, 2015. Photos: (Top left) URI GEMS-Net Instructor Kelly Shea provides tips on implementing Science education into the curriculum to Marissa Colucci, Lower School ELL specialist. (Top right) Kindergartener Xander Smith-Neves enjoys play time on the jungle gym on his first day of school. (Bottom left) “Mr. Henry” (Leite), Head of Maintenance, ensures that all three schools are in tip top shape. (Bottom right) 7th grader, Adonis Teixeira receives a warm welcome from Middle School Principal Eric Charlesworth and Head of School Chris Haskins.